Elpical Claro Premedia provides a complete image processing workflow for printers, publishers and online communication companies that require fast processing of high volumes of images while achieving cost reduction and improved quality. Through the Claro Individual Image Analysis, Claro Premedia individually analyzes each image for a range of specific parameters and then enhances the image for highest-quality results… even images inside a PDF. Claro Premedia also automates other image or photo processing tasks such as intelligent ICC-based DeviceLink conversions or file format conversions. Elpical Claro helps USA TODAY maintain its high standard for quality color and photos. Claro is an automatic image enhancement server. It automates the task of enhancing images manually (interactively) in Photoshop. In Photoshop, people take decisions based on what they see. That is dynamic image enhancement. Every image is different and needs different treatment. Automating image enhancement through batch processing, like with Photoshop actions, is static image enhancement. The same set of filters and curves are applied to the complete set. Some images my come out nice, others may not. Claro replaces the human decision making with image analysis. Each original image gets thoroughly analysed, and based on the results, the technology takes decisions on what to do with each individual image. That is automatic, yet dynamic image enhancement. Based on this image analysis, Claro is able to identify "problem images" automatically. Claro works with hot-folder based workflows (channels). Claro can produce images for various print processes as well as for web and tablet publishing. The Photoshop operators use a Claro client application, the Photoshop Inspector. The images remain in the Claro workflow throughout. Another client application is the Indesign plugin. The Indesign plugin allows designers to submit images from within their Indesign documents to Claro for processing. Since the size and crop-frame of images in the document are known, Claro can resample, optionally crop, enhance and color-convert images before updating them in the Indesign document. In control of your workflow with Elpical Claro Inspector that route images to Adobe® Photoshop® for side-by-side comparisons. Seamless integration with leading workflow solutions like CCI, K4, SWITCH, WoodWing, EIDOS Media, InDesign, Protec, and more. Claro JobClient for Adobe InDesign seamlessly integrates image optimization in page layout workflow. Zip file with a folder structure inside caused channel to go to standby. Fixed. ClaroAdmin bug with deleting a user and then adding one in same session. Fixed. Bug with some smaller files with face recognition. Fixed. PDF with images in Indexed colorSpace with StringObject containing octal values less than 3 characters are incorrect decoded.Fixed. Couple of French translation issues fixed. Return jobticket with one concurrent process missing, fixed. Inspector process info missing with one concurrent process, fixed. 16 bit PNG issues fixed. Improved exception handling if selected ICC profile does not exist. Added "execute external program" option to device-link channels. Portrait recognition: In version 11, Claro is able to classify portrait images as such. This leads to optimized skin-tone treatment and adjustments in noise filtering and local contrast for highlights, leading to better portraits. Banding removal: Claro now detects and removes banding issues in blue skies that may occur in heavily compressed images. JPEG compression artefacts: Claro offers new and improved detection and removal of various types of JPEG artefacts. Improved exposure correction: Claro has improved detection of under- and overexposed images and offers an even higher success rate in correcting these problems. Added localized treatment of key areas in images: Claro offers more controls to include or exclude certain areas in images like skin tones and blue skies to algorithms like the local contrast for highlights feature and the color filter. New plug-in for Adobe InDesign: Our plug-in offers the ability to enhance images inside InDesign documents. The plug-in identifies the size of the picture box and the visible area of the images and takes this into account. The enhanced images fit exactly into the picture box at the exact resolution. The new plug-in offers enhanced user experience and allows documents to be closed while images are in process. Newsrooms will love this: If a major news event occurs, newsrooms will have the ability to tag images shot within a specified range of the location where the event took place. Especially with user generated content coming into the newsroom, it is a huge benefit to be able to immediately identify images shot within a certain proximity of the event. IT departments will love this: The new installers of both the Claro server (Windows and Mac OS X) as well as the InDesign plug-in and Photoshop Inspector are completely independent of pre-installed runtime environments. Added option to use URL’s for input and output in XML jobtickets. Some PNG’s could not immediately be deleted from hotfolder after processing, causing the channel to go to standby for a few seconds. Some PNG’s could not be processed, error message: incorrect pixel stride. When routing jobtickets to a processing channel and the jobticket contained IPTC, the resulting jobticket could be invalid XML. Invalid crop with a jobticket containing crop info, tiff output image and multiple concurrent processes. Fixed bug that caused Claro to stop processing in certain workflows with certain PDFs. Fixed bug introduced in 10.0.29 with “file name extension” in output settings. Added file name suffix option in output settings. Improved performance and stability in parsing XML. Fixed issue with sharpening with a particular image on Windows. Fixed issue with PNG in Inspector whereby in some circumstances the original was not shown correctly in Inspector. Fixed issue with lost transparency with a particular PNG file. Fixed occasional creation of large mdmp files in the install dir. Updated Nikon raw camera libraries. Updated Canon raw camera libraries. Default jpeg compression level for new channels changed to 9 from 10. CCI job integration fix for CCI version >= 3. Automatic recognition of Photoshop version 15.5 added. Fix for 0 byte files not causing delays. Fix for importing Claro version 9 curves with inverted values. Channel selection panel in routing channel is larger and the channels are in alphabetical order. PNG with transparency converted to psd resulted in strange colors. 16 bit layers from 16 bit PSD’s are now processed. Ignoring ColorTransform parameter in PDF if the parameter is not part of the “DecodeParams” dictionary. Fix for sizing problems with CCI version >=3. Extra option in CCI panel to select CCI version. Fix for sFTP connections where the connection could be reset when the receiving side initiates a re-keying event. Tiff files from claro with zip compression were not accepted by indesign. Fixed. Fix for PDF where the decoding parameters for the FlateFilter are placed in an Indirect object. Fix for Tiff files with layers which fail to open in Photoshop when converted to PSD. Fix for problem PDF’s which contain object definition without closing tags. Check on very large xmp blocks in TIFF. Skipping these as this might cause out-of-memory errors. Fix for jvm crash at startup of process. Extra option to skip “Ignore images placed side-by-side or overlapping other images” only if less pixels than specified amount. F5 key to refresh the queue window in Inspector functions again. Channel with “scanonlyjobfiles” and a case-sensitive OS would not pickup files with capital extensions. “The import arguments may not be null message” on a PSD image with hidden layer is fixed. Fix for Tiff LZW output compression which caused sort of inverted images. Temporary ICC files were not removed after moving image files to folder after for example a quality warning. Fix for very large ICC profiles. PDF’s with corrupt compressed stream without ending compression marker are processed correctly. Prevent illegal ASCII characters from LCMS. Fix: processing only those images in a PDF that do not have a specified XMP tag/value did not work if images did not have XMP metadata at all. Log information of Claro was not written into the XMP of images (since version 10.0.23). XML return ticket is sent after the Image has been sent with (s)FTP instead of concurrently. ClaroAdmin did not always show the stop/start button if it should (started on same system as Claro is running on). Fix for ClaroAdmin appearing to freeze, but is waiting for user-input in another window. Embedded HTTP server is upgraded to newer version. Fix for ClaroAdmin not showing screen if you would like to start Claro if ClaroAdmin is started from the same system as Claro is installed on. Fix for JVM crash with core dump (EXCEPTION_ACCESS_VIOLATION). Claro logging shows more detailed system information at startup making it more easier for support to advise on concurrency and memory settings. The previous version showed in ClaroAdmin the network logging from a MultiServer environment. It appears that this leads to problems because of too much access to this log (and delays because of the network access to the storage) causing unacceptable delays in the Claro Administration. The logging in ClaroAdmin shows now only the local log. In the advanced tab of Input in a routing channel an extra option has been added: “Use IPTC from jobfile and image”. In previous versions routing on IPTC used either the IPTC from the jobfile (and IPTC imported via XPath) or if it did not exist the IPTC from the image. With this option first the IPTC is taken from the jobfile (and XPath) and for IPTC fields which are not available the IPTC fields are used from the image itself. ClaroAdmin did not close the file for locking the preferences. This could cause an error in the operating system “Too many open files”. Improved Inspector failover in cluster environment to backup cluster. Added basic Inspector functionality to the channel- and group-overview in ClaroAdmin. Special option CropWithBox was not saved correctly. Timeout for http connections increased. Possibility to specify a backup cluster in ClaroServers.conf. Add the line: “backupserverlist=” (similar to “serverlist”) listing the servers that are part of the backup-cluster. The client applications will connect to one of the servers in “backupserverlist” if none of the servers in “serverlist” is available. Known limitations: Inspector will only connect to a server from “backupserverlist” if Inspector is already running. It will also not reconnect to the primary cluster automatically if that becomes available again. The setup (channel selection) is manual. ClaroPreferences.xml might be different in backup cluster. Limitations will be fixed in next update. In inspector.ini, an option can be added: EnableUseNoneButtonJobFile=1 to enable the use none button in Inspector also when job files are used. Improved logging if copy of files to temporary folder fails. Fix for resizing images in PDF with a mask. Because of rounding errors the mask and the image could have a different resolution (1 pixel). Fixed. Fix for Claro running in MultiServer and using concurrent processing, the lock files were left behind for a time-period specified by the lock-timeout value. Possible now to change the email address with which a customer is registered with. De Persgroep Publishing (dPP) is a 100% subsidiary of De Persgroep, which has expanded from a local, Flemish media company to a leading bi-national organization. dPP is active in newspapers, magazines and new media and home to a number of market leaders such as Het Laatste Nieuws, Dag allemaal, Goed Gevoel and HLN.be. The turnover of de Persgroep is around 750 million euros; for the whole group this is one billion euros, which makes it one of the largest media companies worldwide. Like other publishing houses, dPP faces significant challenges going forward. The ongoing financial recession puts pressure on revenues – especially from advertising. Additionally the advertisement market is experiencing a shift to digital media and television, taking away revenue from traditional print advertising. Lower consumer confidence is yet another trend in the reader market; people buy fewer individual issues and are switching titles more often. dPP still flourished in this changing landscape; through focus on traditional print and embracing new digital media, the group managed to maintain and for a number of titles even improve reader numbers. dPP also invested in a joint IT platform which improves performance and reliability while decreasing costs. This is where Elpical Claro Premedia comes into the picture. In 2009 de Persgroep Publishing started a division in the Netherlands, acquiring some of the major local newspapers such as Algemeen Dagblad, de Volkskrant and Het Parool. All existing ICT systems were migrated and integrated in the existing ICT platform in Asse, Belgium. Marc Roelants, ICT Project Leader - Editorial and Advertising Systems explains: “With the growing number of publications, automating the production of these publications became crucially important; it is the only solution to reduce human intervention and therefore errors. Especially because we also face the challenge to automate our production workflows in such a way as to make it possible to publish both to paper and digitally online and on mobile devices. In order to make the integration possible, the software needed to have robust automation capabilities, coupled with excellent image optimization that allowed individual images to be further optimized by dPP’s Flash Center. It also needed to function in a dynamic way, using job tickets and web services to drive it from the larger workflow system. Elpical Claro Premedia fulfilled all of those needs, and that is why dPP finally went with the solution after analyzing the different products on the market today. In order to ensure 100% uptime for Claro Premedia as it is integrated into their production workflow, dPP and Elpical worked on comprehensive cluster support for the new Elpical Claro Premedia 9. This ensures that a server with software or hardware problems doesn’t affect the entire image processing system; the load is dynamically shifted to the remaining processing servers. De Persgroep Publishing handles a huge number of images day-in, day-out; so many that it would be cost prohibitive (not to mention too time-consuming) to optimize all of them manually. This is the typical scenario where Elpical Claro excels. Not just because it can handle a vast amount of images in a short period of time, but also (and mainly) because it knows its own limits. “Starting with version 9, Elpical Claro can be configured in a true cluster configuration. This ensures high availability and provides load-balancing across multiple servers, ” explains John De Jong, CEO of Elpical Software: “This is of course very important to our bigger customers. However, it is the built-in quality control that is the most important functionality”. further manual cleanup. Claro comes with a Claro Inspector plug-in for Adobe Photoshop where a retoucher can see the original and processed image. This allows a quick decision on whether the original or the processed image is better and allows further manual processing in Photoshop. “You can mix this automatic and manual mode in one Elpical Claro installation,” continues John De Jong: “This allows a publisher to make different workflows for different magazines or newspapers for example. For some publications completely automatic processing might be the best option, while for high-quality, glossy magazines every image could be pre-processed by Claro but quality controlled and further optimized by a photo retoucher in Photoshop. That’s really the best of two worlds”. SmartRepro sought to maximize in-house talent to improve processes and final product quality. A new infrastructure included the establishment of publication-specific repro hubs that would, for example, address timeline bottlenecks within and across publications (such as reduction of proofing cycles). Each hub is connected across the network, making it easy to move work around when necessary. Specific strategies included training design staff to better assess images and print-ready work, as well as understand color space and conversion fundamentals to recognize color problems and correction requirements. minds in the beginning, negotiations, and carefully structuring how we rolled this out, with a constant eye on how we would safeguard quality. We started in May 2006 - and a year later we successfully incorporated the process with all of our titles. Picking the right tools and adapting them over time has been key to the effort, as well. “We invested in workflow tools to insure that we had a robust, industry standard workflow,” said Hargreaves. that base philosophy of quality photographic output, the Claro analysis tools individually analyze images to ensure sharpness, contrast, brightness, color balance and other parameters. The results are consistently superb image quality. them what it could do,” says Hargreaves. Alan Dixon of Workfl owz, Elpical’s UK partner, joined Elpical’s John de Jong in going to BBC to set up an in-depth demo and product evaluation with initial set-up and training for BBC to build upon. Further tweaking and enhancements to match BBC’s internal departments’ requirements were developed with Hargreaves’ guidance, before the system was rolled out to various titles. “We threw lots of different images at the software, tweaked it, and got proofs that achieved what I felt was a significant difference, and once I showed the editors here at Top Gear what can be achieved, it was met with such enthusiasm that it drove sign-off on the investment,” Hargreaves says. The system also shines in the challenging areas of greens, blues, and skin tones - and that’s something that BBC’s Gardeners’ World magazine needs to get “Just Right”. Not surprisingly, the plant photography across this well-known gardening publication contains a lot of greens, not to mention highly varying levels of subtlety from green to green. Hitting the quality bar while meeting a rigorous production schedule was challenging. “With Gardeners World we’re using the new green tones setting, and getting great results,” Hargreaves reports. This achievement was made possible by his decision to give each publication its own, unique profile. Integration also makes for success. For example, Hargreaves says BBC integrated Claro with its workfl ow to take advantage of Claro’s sharpening function. “When our pages are submitted to the workflow, it makes calls to Claro. The ICC conversion happens in Claro and images are sharpened there as well, so it’s a two-pronged, integrated approach,” he says. As an added benefi t, Claro insures that all images are analyzed in some way. Claro analyzes the CMYK profile against the gamut of the image going in. If the image is out of gamut by more than 20%, Claro applies a perceptual conversion. This, says Hargreaves, brings a whole new level of consistent quality to the process. on extensive image analysis, the technology enables publishing houses to automate the enhancement of produced images. ELPICAL was established in 1997 by a management buy-out of the Electronic Imaging department of Victor Hasselblad AB. ELPICAL since has grown to become a leading specialist in the field of digital image enhancement and management. The Saarbrücker Zeitung is a daily newspaper published with a circulation of about 180,000 copies and 11 regional editions. The prepress processes at the SZ are completely digitised and work under colour management conditions. Since October 2004, the new ISO 12647-3 process standard has been applied. The Elpical Claro PreMedia server has been used in conjunction with Adobe Photoshop for control of the image workflow and image optimisation, or pre-optimisation, since the beginning of the year 2000. An interface to the CCI editorial system was realised for this purpose. At the Saarbrücker Zeitung, every image is checked after automatic image optimisation. Gerhard Merker, IT production manager at the Saarbrücker Zeitung, considers this to be essential for reasons of quality: "The standard of quality of some of the material we receive is so poor that we cannot rely on automatic optimisation alone. However, despite this quality check, we have still succeeded in reducing the processing time for colour images from 15 minutes in the past to about one minute today”. All agency images (received via Fotoware software) first enter an image in basket in the CCI editorial system where all images, whether from the newspaper’s staff photographers or freelancers, are put. The integration with the editorial system makes available the images to the editors in their own environment. The editor can pull a selected image directly on to the page in a non-processed state (RGB-JPEG). Then he defines the image section and size. It is only after that that the image data are sent as a raw file and the accompanying metadata (image size, section, position, etc.) as XML file are exported for optimisation to Claro. Claro works with various reproduction channels, depending on whether the image is destined for the daily newspaper, the web or a different product, e.g. an insert produced outside the company. Accordingly, different settings (output profiles) are stored that are used as a basis for the automatic processing. It can also be determined whether all images should be sent to the reproduction department for checking (as is the case at the Saarbrücker Zeitung), or only images that fail to satisfy certain specified criteria. With InSpector, a Photoshop PlugIn, the image processor can retrieve the automatically optimised images one after another at his workplace for checking, or after-processing respectively. He is shown the processed image (in CMYK) alongside the original (in RGB). He now has a choice of two options: either he accepts the processed image ("use processed”) or he further processes it. If the optimised version is unsuitable for use, the original image can be processed immediately before he returns it to CCI ("use original”). According to Gerhard Merker, this is a very useful arrangement that has a direct effect on the image quality and therefore the quality of the product as a whole. At the end of this process, the complete page goes to the PostScript RIP and finally to the imager. The images are archived in their original state (i.e. non-processed). The CCI editorial system keeps all versions of the image ready for retrieval. An automatic routine transfers the images (and the text, but not the pages) at night to the Elias archive. At the same time, the images are exported in a corresponding version for the internet page. An interesting difference to the procedure in widespread use is that, in the workflow at the Saarbrücker Zeitung, the images, are not processed in advance, but only after size and section have been defined. "I do not think it logical to optimise the images before”, says G. Merker and explains why as follows: "There is a difference whether you produce an image as a single-column or four-column element, especially as regards image sharpness. Sharpening must be done in the final size, otherwise you will inevitably experience a loss of quality. The situation is exactly the same if you subsequently take a small section from a large, already optimised image. The complete image may perhaps be all right by itself, but this does not mean that the section will be so. The image must be optimised on the basis of the actual section.” A second point concerns the data volume "When the image section is defined, the rest that is not required will be removed. The image data will be converted accordingly by Claro. This reduces the data column and optimises the resolution.” The program carries out the colour space transformation or colour separation respectively from RGB to CMYK via the profile. It proved more problematical to realise the interface to the CCI editorial system, a project on which both Elpical and CCI cooperated. Some trade-offs were necessary, but the final result was a highly-integrated image workflow. Sanoma Magazines Belgium is part of the international magazine division of the Finnish Sanoma Group. In Belgium, the company is primarily known as a magazine publisher, but it is also a modern multimedia company with multiple sites for its magazines. Divided into two branches; one in in Antwerp and one in Diegem, the company counts more than 500 employees. It is a leader in its segment and has developed a strong reputation with many famous magazines such as Flair, Libelle, Femmes d’Aujourd’hui, HUMO, Feeling, Goedele and Marie Claire. Fancy magazines ask for beautiful images. Clear, sharp and with fresh colors. Nevertheless, in reality most of the supplied images are not ready for use and image correction is required. Bart Van Looy, ICT Publishing Project Leader at Sanoma Magazines Belgium explains: “Before we started to work with Claro Premedia, all image adjustments were made manually in Photoshop® and that took a very long time. Generally these are fairly simple but necessary adjustments to the color balance, color saturation, sharpness, brightness and contrast. Moreover, there was much time lost searching, opening and saving the images in the right place.” A solution that not only automates repetitive corrections, but also saves the images through intelligent routing to the right place would help. The impact of Claro Premedia was immediately measurable and noticeable after installation and configuration. Thus the flow of images and color correction of images for the various TV magazines is now fully automated. Without any manual intervention, the imported images are corrected in Claro Premedia and saved in the correct location. Bart Van Looy: “It is fascinating to see how quickly the corrections are made and how it ends up in the correct folder. The predictability also improved since Claro interprets and corrects an image always in the same way.“ For exceptional cases, or when doing extreme adjustments, with Claro Inspector for Photoshop® the image editor has the possibility to compare the original and corrected versions side by side. The image routing is done using file naming conventions and IPTC data. This approach guarantees an unlimited number of correction channels with corresponding hot folders, to collect and save images. The support and addition of XMP data also ensures perfect compatibility between the various workflow systems at Sanoma Magazines. All information about the image is kept, so you can always see what and when something has changed in the image. ELPICAL Software, based in Giesbeek, The Netherlands, develops and markets software solutions for the production and enhancement of digital images and the automation of the image workflow. Based on extensive image analysis, the technology enables publishing houses to automate the enhancement of produced images. ELPICAL was established in 1997 by a management buy-out of the Electronic Imaging department of Victor Hasselblad AB. ELPICAL since has grown to become a leading specialist in the field of digital image enhancement and management. St. Galler Tagblatt AG, the largest media company in eastern Switzerland, publishes daily newspapers as well as professional journals, weekly magazines, customer magazines and electronic media. Ronny Bleichenbacher, who is head of Production IT Support at St. Galler Tagblatt, learned about ELPICAL's Claro Premedia Server software solution when he chanced to pick up a company brochure at Ifra 2006 in Amsterdam. The headline, "automatic image enhancement based on comprehensive image analysis", caught his eye. Bleichenbacher wanted to switch the group's Macintosh-based workflow to Windows and had been searching for an image correction and automatic retouching solution that reduced the number of image management processes currently in place. When he learned more about the Claro Premedia Server's capabilities, it was a 'eureka!' moment of discovery – "I said, this is it!" recalls Bleichenbacher. Ronny Bleichenbacher reports that the investment is delivering strong return on investment in the form of productivity, ease of operation and improved image quality. "The Claro Premedia Server provides us with more possibilities for automatic image enhancement than we had ever dreamed of," states Bleichenbacher. The Claro Premedia Server solution replaces a previous program for image correction and automatic retouching that was Mac-based. When the company converted to a Windows workflow in 2003, the Window's version of the former program still didn't have the right capabilities to handle St. Galler Tagblatt's demanding production requirements. "Prior to installing Claro Premedia, our images went through eight different production workflows before finally being printed. Now we are able to condense these image management processes into a single workflow," explains Ronny Bleichenbacher "All processes from copying, transporting, proofing, retouching and final image checking –run in the background and are fully automated." Claro Premedia analyzes each image based on parameters like sharpness, brightness, contrast, color balance, natural greens, skin tones, IPTC information, etc. Depending on the sharpness and noise levels of the original image, the unsharp masking process varies in terms of intensity, radius and threshold. The solution's special contrast algorithms modify the contrast wherever necessary in an image, making it possible to enhance definition even in dark areas. As an option, images can be sorted by quality criteria and checked manually. Ronny Bleichenbacher is particularly impressed that the original image and the image edited by Claro Premedia can be compared side-by-side and further retouched. His verdict: "Since Claro was installed in March 2007, our image enhancement results have improved significantly and become more uniform." In turn, the time required for image enhancement and data handling has been reduced by some 15 percent. St. Galler Tagblatt AG has converted one of its publications to the Claro Premedia workflow almost every month since the initial installation. Thanks to the freed-up capacity and improved image quality, prepress production activities for the company's own publications are now handled in-house again after having been outsourced. The new capabilities are also opening the door to increased business with existing clients and the possibility to attract new customers. Another key advantage is the ability to connect Claro Premedia with the K4 editorial system from SoftCare, a popular industry standard. According to Bleichenbacher, one of the main advantages is the central settings option for the image workflow. He can now centrally control changes or individual pre-settings for automatic image enhancement for all networked editorial departments within St. Galler Tagblatt's group of publishing houses. "I never would have believed how few buttons are required for the high-quality enhancement of an image," concludes Ronny Bleichenbacher. The manufacturer's key products include Claro Premedia Server, 4LeafCover, EmailManager, SlideShowEnhancer and the Claro module for Gradual SWITCH. ELPICAL's core competence in the field of digital images makes the company an ideal partner for other software suppliers who want to combine ELPICAL products with their own applications, or for system integrators who want to integrate expanded image functions in their own products. ELPICAL has concluded an OEM agreement with, among others, OCÉ© for the enhancement of embedded images from PDF documents. www.elpical.com. Ready acceptance and adoption of the latest technologies has been a hallmark of the publication’s success. Without such technologies, the newspaper could not exist. The technology it employs is both extensive and sophisticated, incorporating communications satellites for file transmissions. And the entire USA TODAY production system, from pre-press to Computer-to-Plate, satellite network, and through to the actual printing plant, was designed with quality as the key goal. The latest technology plays a major role in the publication’s prepress operations department, which processes material provided by both its customers and the editorial department. file formats based on the production need. EPS files are sent to the paper’s CCI pagination system for placement on editorial pages. Ron Cobbs says: “For us, making the transition to an all digital workflow was about maintaining that level of quality. G4 TIFF files are sent to Newsway, the CTP system, for transmission to print sites. All advertising and editorial images are already in digital format when they come into the department. Up until a few years ago, image quality assurance and optimization during the “pre-media” phase of production at USA TODAY was purely a manual proposition, except for whatever QC could be achieved using the department’s standard applications, including Adobe CS4, Acrobat, Photoshop, Pitstop, and a few other tools. It wasn’t the most efficient use of operators’ time. This changed about three years ago, shortly after Print 07. The Claro software individually analyzes each individual image for a range of specific parameters including sharpness, brightness, contrast, color balance, natural greens, skin tones, Exif information and more. It handles image manipulation tasks automatically and optimizes the files for their intended uses. With Claro in the workflow, images are automatically converted and corrected based on USA TODAY pre-defined criteria. This allows the operators more time to work with images that require manual intervention. Claro can be helpful in those cases, as well – for instance, the software makes it possible to compare the enhanced image with the original in order to determine best next-steps. In addition to working with many image input sources, the USA TODAY prepress operations department works with images already pre-formatted for different devices. Some images may come in formatted for web, coated for high ink density, for example, and need to be corrected and have a new profile for newsprint applied. Webinar - What's new in Claro 11? Webinar - What's new in Claro 9? Below you can find the webinar of Elpical Claro 9, where its newest features are demonstrated. We have a closer look at how Elpical Claro edits pictures and how to use the plug-ins, as well as at the way the parameters for a whole range of settings can be set. This can help you reduce time spent on each image without sacrificing quality. 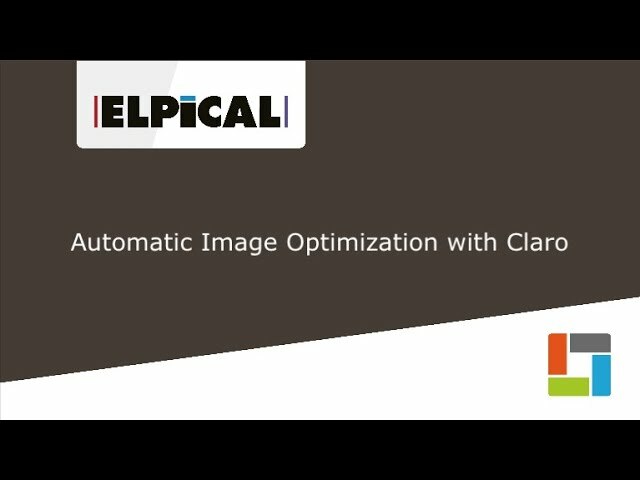 Elpical Claro is an automatic image optimisation and retouching application. In this webinar, we will cover the overall capabilities of Claro, how it can be implemented in different workflow scenario’s and take a closer look at the specific new features of Claro v11. On October 16, 2017 Tom Peire, CEO of Four Pees, held an English webinar to introduce you to the new features of Claro 11. Do you already know how to improve image quality while decreasing retouching time? Some big names in the industry such as BBC Magazines, Sanoma, Bonnier, Frankfurter Allgemeine Zeitung, Mondadori France, Modern Luxury and USA Today do. They use Elpical Claro! 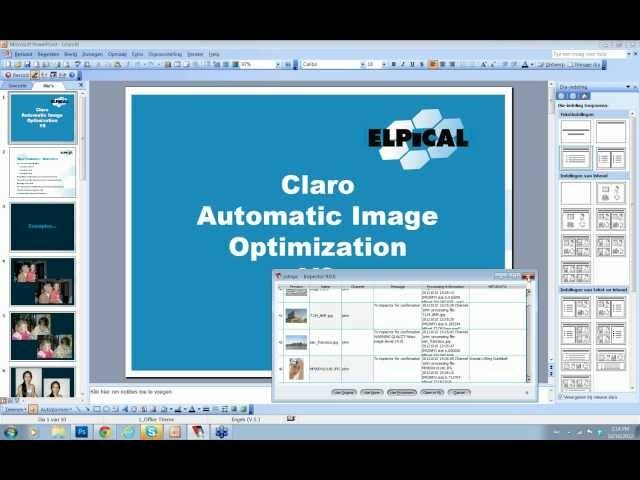 During this webinar, Tom Peire will introduce you to the benefits of the automatic image optimization software Elpical Claro. He will also explain how you can easily integrate it into your existing workflow - no matter if you are a printer, publisher or an online communication company. 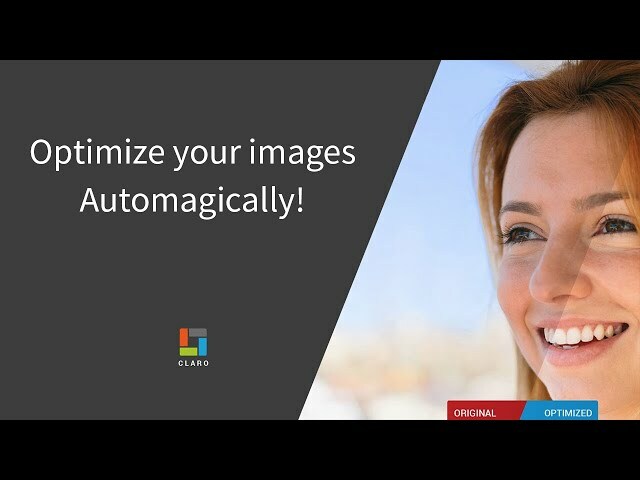 Elpical Claro excels when it comes to high volume image optimization. For you and your team this means reducing production time and costs while delivering consistently high-quality image enhancements. The short answer is to give you minimum and recommended system requirements. We will do this here. First thing you will notice is that minimum and recommended requirements are far apart. The reason for this is that Claro can be configured to process one, two, three or four images simultaneously. We call this concurrent processes. This means not only the minimum and recommended requirements are far apart, but also the achievable throughput with those requirements. "Recommended" here means "get the maximum performance out of your Claro license". If you process 100 images per day (and not all at the same time), the minimum requirements are probably sufficient.